Assam Higher Secondary Education Council. 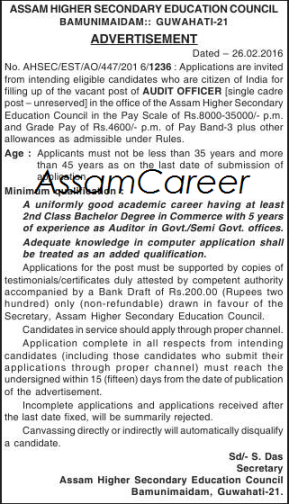 Applications are invited from intending eligible candidates for filling up of the following post in the office of Assam Higher Secondary Education Council. Educational Qualification: A uniformly good academic career having at least 2nd Class Bachelor Degree in Commerce with 5 years experience as Auditor in Govt./ Semi Govt. Offices. Age: 35 to 45 years. Application Fee: Rs 200 in the form of Bank Draft.